Ever since my cancer diagnosis I am careful as to what cleaning products I bring into my home; that goes for household products and skin care. 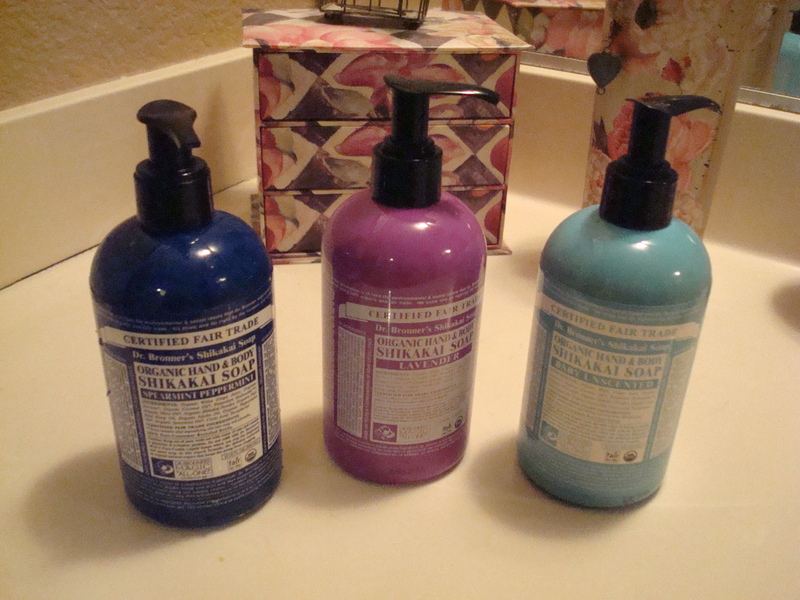 The only soap I used before my diagnosis that was allowed to stay, is the liquid soap made by Dr. Bronners. I have been using his almond and lavender soap for at least twenty years. 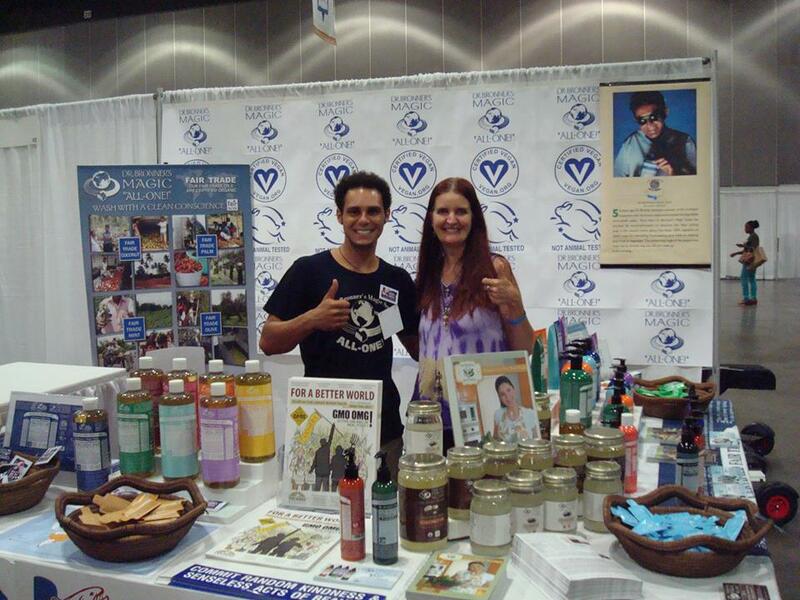 Last fall I went to the LA Green Festival and I got to meet one of his employees who was working a booth there. I told him that their lavender soap, is the only soap that didn’t make me nauseous when I had cancer. Before I left I gave him my card with my blog and email address in case he was interested in reading my story. I also mentioned that Dr. Bronner’s Magic All-One! Soaps were on my blog’s “favorites” list. Last week, I got an email from their PR department asking if I tried their new pump soaps. No, I didn’t, so three bottles, peppermint, lavender and unscented arrived yesterday. * Just to be clear, no one at the company is paying me to write this but I was asked for my opinion in exchange for trying the soap, since it’s a fairly new product and that is what I’m doing. I never bought pump soaps because I just never gave them much thought. It was never a big deal using the squeeze bottle or bar of soap. I decided to put the peppermint scented one in the kitchen because it reminds me of food. (Ok, to be honest… years ago I bought peppermint liquid soap and used it on my body and when it touched my lady parts…let’s just say it was too “minty fresh” and leave it at that), but that doesn’t mean it isn’t a good hand soap. The lavender one is in the shower and that one smells awesome! Your probably thinking, “Ok, she likes the soap. So what. Soap is soap.” But that’s not true. All soap is not the same. Commercial soap is made from a zillion different chemicals, some of which are made from formaldehyde (you know the stuff they use on dead people). Other chemicals can be carcinogenic; meaning they can cause cancer and I am doing everything in my power to never get that again. Then there’s that nasty sodium tallowate, which is made from animal fat. Since I am vegan, washing my face with animal fat isn’t going to work for me. Organic Sucrose, Organic White Grape Juice, Organic Coconut Oil, Potassium Hydroxide, Organic Olive Oil, Organic Shikakai Powder, Organic Hemp Oil, Organic Jojoba Oil, Citric Acid, Tocopherol. The fragrances they use comes from real essential oils. 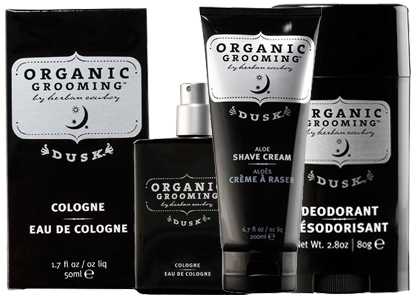 Another reason I support this company is because of their commitment to the environment and fair trade practices; their products are not tested on animals, and the products are vegan and certified organic. If you want to know more about Dr. Bronner’ Magic All-One! company, click here. You can buy their soaps at Trader Joes and most health food stores but if you don’t live close to one, you can buy right from their website or Amazon. I have seen this brand for years in my health food store, but today is the first time, I really looked at them. They are vegan! I bought the eye shadow kit… next month, I will treat myself to a new fragrance. You might also find them in your Target store.